I’ve covered a few Camden Yards food options…you can learn about a bit about the Yard’s menu here, but Oriole Park is still in Maryland last time I looked, so crab stuff is pretty popular. Enough to devote a separate post to it. The Old Bay addition makes it Orioles colors! 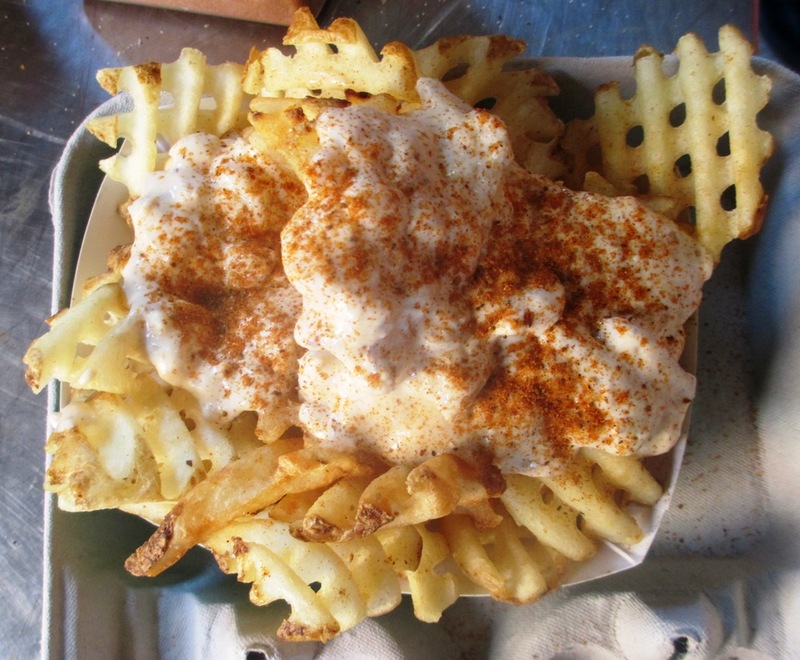 1) Crab Dip Waffle Fries. 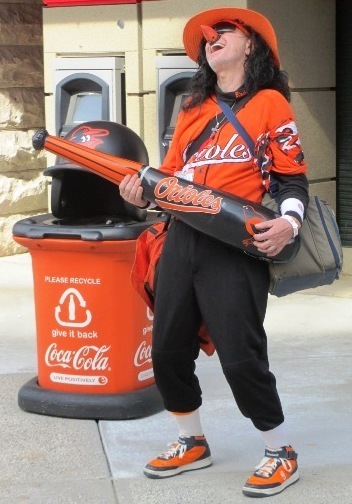 This is a pretty big go-to item for Orioles fans. If you’re familiar with the Chick-Fil-A waffle fries (and who isn’t? 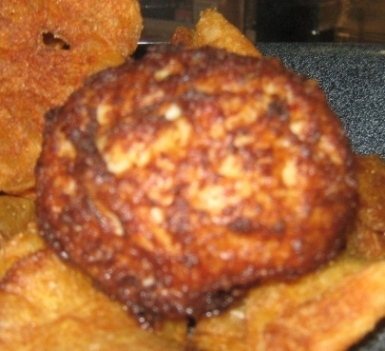 ), they’re like them, but topped with Maryland crab dip sauce, and you can shake on some Old Bay seasoning at a condiment stand. Get them at Old Bay Seafood, Freestate Fries or the Flying Dog stands, and get a fork…you’ll thank me. 2) The Crab Chipper. 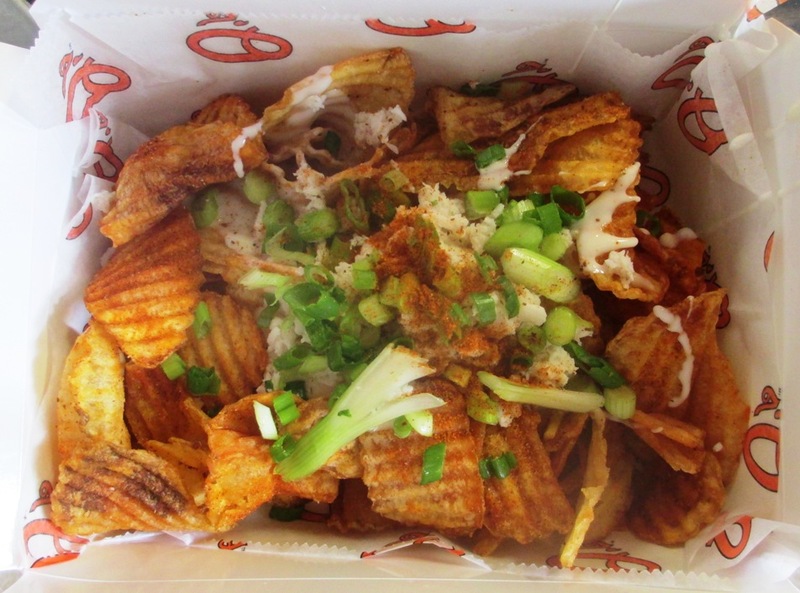 The Chipper stand has become one of the more popular Camden Yards food options now since its arrival in 2015 – and this Crab Chipper features kettle chips (or pork rinds!) topped with crab meat, white cheddar, green onions and Old Bay…so they’re, you know, kind of like fancy nachos. The Official State Fish of Maryland. 3) The Old Bay Seafood Crab Cake. I remember in the early days of Oriole Park watching a friend of mine shell out $4 for a crab cake the size of a golf ball. This was before ballparks were known for food options. Hope he enjoyed it. Today the crab cakes may be more expensive, but they’re now appropriately baseball-sized and much tastier – the Orioles had a chef sample 50 local crab cakes (!) to come up with a recipe for this OPACY delicacy. Hopefully not at once. The Old Bay stands are in the lower and upper concourses. 4) Bonus Option! 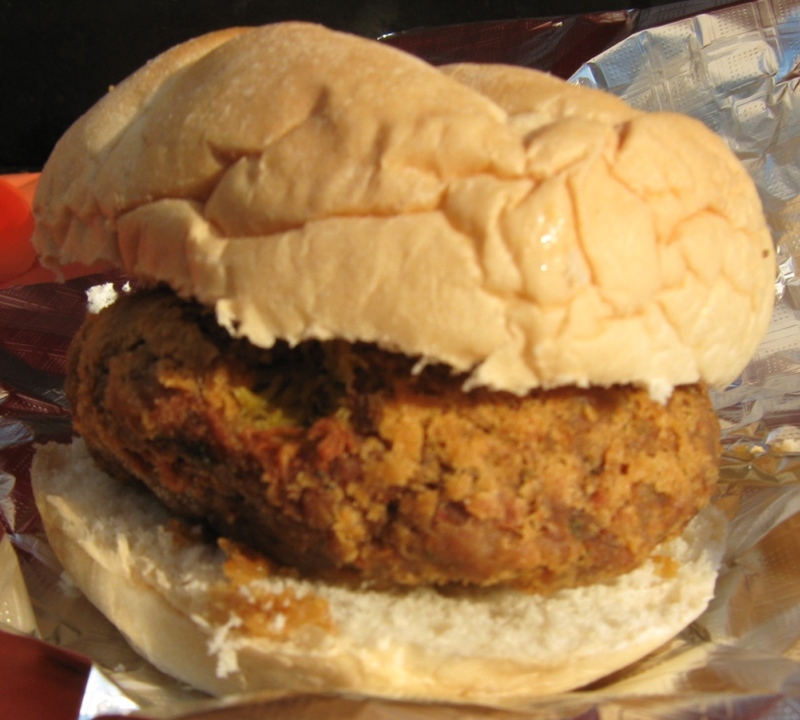 The Jumbo Crab Cake Sandwich at the Pickles tent. I don’t know if it’s actually Pickles Pub that serves up this tasty sandwich in the big food tents they set up outside before each game. But the nice thing is getting a decent-sized crab cake sandwich for a few bucks less than inside (I think this was $10)…get it wrapped up and take it in. There you go…three crab-tasty Camden Yards food options, with an extra base thrown in at no additional charge.